Pez returns to Australian stages for his first headline tour in more than 3 years. To highlight the important influence Pez has had on the Australian hip-hop scene, you need only to look at the two supports from that 2009 tour – a little known rapper named 360 and an upcoming MC named Seth Sentry. The Back In The Game Tour will roll through 21 dates nation-wide and provides Pez with the chance to unveil tracks from his long awaited sophomore album – including current single The Game. The video for current single, The Game, was directed by Grey Ghost, and recently named Channel [V] Ripe Clip Of The Week. This artistic collaboration is indicative of the approach Pez has taken with the new album as the songs came together collaborating with an array of old friends and new names. Due for release later this year, the album, like this tour, promises to be something unique and very special. Fans can expect a highly evolved album full of banging beats, raw lyrics and the trademark Pez flow. Pez has invited South Australian rapper, and current triple j favourite, Purpose to join him on the road, adding spice to an already killer night, and continuing a history of Pez throwing down and supporting the future of Australian hip-hop. 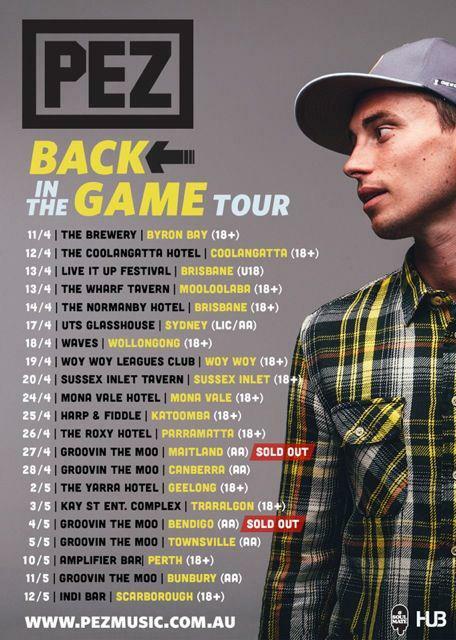 But most importantly the Back In The Game Tour celebrates the re-emergence of Pez as an important voice across all genres of Australian music. You will not want to miss this. * Purpose not appearing – Proudly supported by Live Solution, Oztix & Deezer. Next Post Dave Vs Goliath – It’s Big – It’s Catchy – It’s ‘The Original’. Big Dave Feat. Snoop Dogg! !